Many brands of flea and tick products are available for use on dogs and contain a wide variety of chemicals. The safety of these products need to be judged on an individual basis based on the types of chemicals present in the product as well as the mode of application. Many flea and tick collars contain carbamate or organophosphate insecticides. Organophosphate and carbamate pesticides kill insects by inhibiting cholinesterase enzymes. Mammals, including dogs, are also vulnerable to cholinesterase inhibitors. An overexposure to these substances can cause rapid heartbeat, dizziness, nausea, wheezing, throat spasms or death by respiratory failure or cardiac arrest. 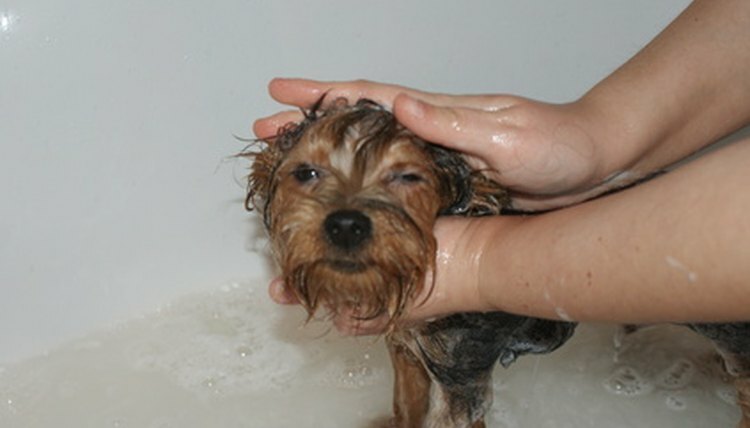 As of September 2010, pet flea collars no longer will contain the pesticide carbaryl. The National Resources Defense Council (NRDC) is also urging the U.S. Environmental Protection Agency (EPA) to ban the use of tetrachlorvinphos and propoxur in pet products, stating that, "High levels of pesticide residue can remain on a dog's or cat's fur for weeks after a flea collar is put on an animal." "Spot-on" flea and tick treatments are once-a-month insecticides applied directly onto the pet's skin. In 2009, a recent spike in the number of pet health-related incidents associated with spot-on insecticides caused the EPA to began a lengthy evaluation. The EPA concluded that the products are safe to use, but need better labeling to prevent misuse by customers. In particular, the EPA will require better instructions on the proper dosage per pet weight, and a differentiation between products meant for cats or dogs. "Most incidents were classified minor," states the EPA report, "but all products had deaths and major incidents." Adverse reactions in both dogs and cats include vomiting, diarrhea, salivation, itching, hair loss, skin ulceration, lethargy, nervousness, ataxia, terrors, seizure and death. Many pet flea sprays, dips and powders contain pyrethrins or pyrethroids. Pyrethrins are natural substances extracted from chrysanthemums. Pyrethroids are synthetic pyrethrin, created in a laboratory. Both compounds affect the nervous system and result in repeated firings of the nerves, which causes death in insects. Pyrethrins and pyrethroids are toxic to cats and cause sensitivity reactions in some dogs. A dog that is sensitive to these substances will salivate, tremble or vomit. Some dogs will have seizures. Some newer products target unique insect processes to control fleas. Being flea specific, they are safer to use around dogs than traditional insecticides. Insect growth regulators mimic the juvenile growth hormone of fleas, interrupting the normal life cycle of immature flea larva, causing death of the larva. Insect development inhibitors inhibit the creation of chitin. Chitin is the principal component of the outer skeleton of insects. Without chitin, flea larva die because they are unable to mature. The National Resources Defense Council recommends frequent combing, soapy baths, weekly washing of pet bedding and regular vacuuming as the safest way to control fleas. Keeping grass and shrubbery clipped short in areas where your pet plays is also an effective way to reduce problems with fleas and ticks.